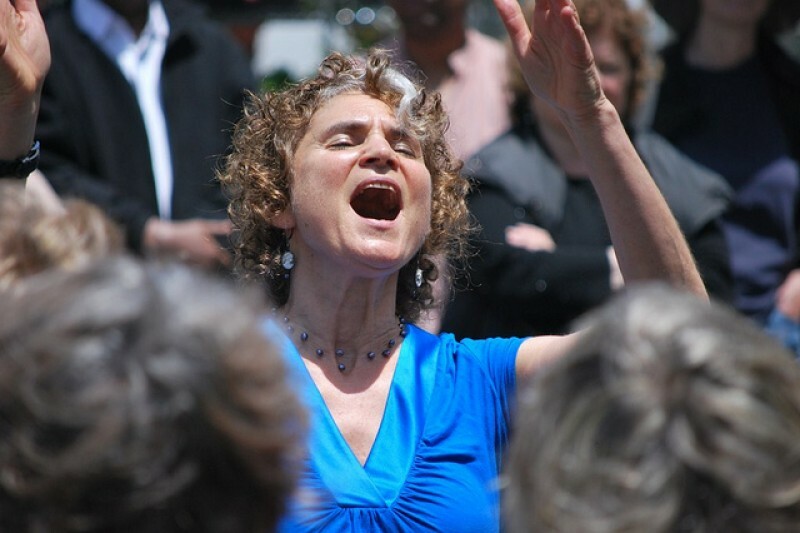 Choral director Betsy Blakeslee spearheaded Expressive Arts Refuge, a team that uplifts the lives of youth in conflict zones. Expressive Arts Refuge ran a music program at Calais Jungle refugee camp, France for 8 weeks in July and Aug, 2016. EAR organized 3 concerts showcasing refugee youth and adults on makeshift stages, performing with EAR musicians from the US and Belgium. EAR assisted with the production of a play titled To Be or Not, written and acted by refugees. The play toured France to national acclaim. EAR partners with non-profits in refugee camps and conflict zones. We've spent gofundme donations on sleeping bags, medical supplies, undergarments, shoes, a simple sound system, and phone credit. We directly deliver items and enrichment classes to refugees. The EAR team self-funds its travel and accommodations. Rather than start a new gofundme for each year's summer program, we add to the existing account. In July 2017, we collaborated with Caritas on an inter-cultural music program for homeless refugees in Calais. In August, we partnered with Hope School -- a refugee-led initiative that educates 350 refugee children. We ran a music and English program at Skaramagas Refugee Camp in Athens, Greece. Most Skaramagas residents fled war in Syria and Iraq. Refugee youth expressed themselves, shared their music, performed and enjoyed a respite from their travails. In August 2019, EAR will partner with Jerusalem Youth Chorus to direct a music summer camp for Palestinian and Israeli Jewish teens in Jerusalem. We're raising funds to pay their staff to translate, facilitate dialogue, and administrate. Funds will also pay a promising young Palestinian conducting fellow to join the teaching team and guide us in cross-cultural awareness. educator/author/summer camp director Judy Kranzler and her assistant Andy Wyrobek, and Tami Halaby -- sister to everyone she meets. EAR director Betsy Blakeslee developed and ran programs in music and art to enrich the lives of youth in wartime Bosnia during the 1990s. The EAR team adapts its program each summer to the people who attend our classes. 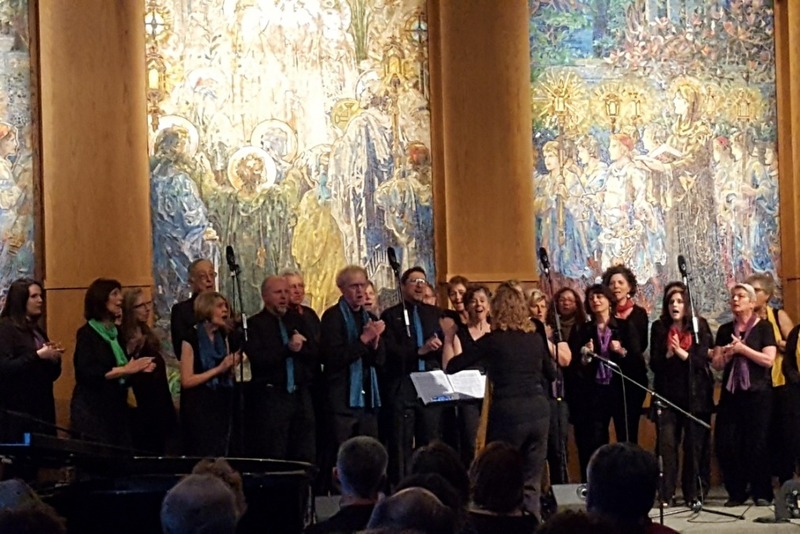 Concert for Jerusalem Youth raised $2000 for a singing summer camp for Palestinian and Israeli Jewish teens in Jerusalem. A big thank you to everyone who contributed to the event! Jerusalem singing Camp will meet from Aug 11-22. Expressive Arts Refuge's collaboration with Jerusalem Youth Chorus and Jerusalem International YMCA is moving forward. EAR's music teaching team includes outstanding musicians with teaching experience in diverse groups - Moira Smiley, Austin Willacy, Betsy Blakeslee, and a Palestinian conducting fellow from E Jerusalem. Jerusalem Youth Chorus provides coordinators, translators, and professional facilitators of dialogue. The Y provides a beautiful private space in which to hold six hours/day of classes in singing, body music, beatboxing, harmony. Teen participants will attend 90 minutes/day of facilitated dialogue. Your donations pay professional facilitators, translators, and coordinators. As always, the EAR team is entirely self-funding. None of the funds raised here will pay for EAR's expenses. Every day, Palestinian and Syrian refugee Every day for 5 weeks this summer, children snaked through the narrow alleys of Bourj el Shemali refugee camp near Tyre, Lebanon. They were on their way to attend violin, guitar, and singing classes. Expressive Arts Refuge arrived to add singing classes where we taught six songs in four languages. We also assisted in existing music classes run by LEAP (Learning for the Empowerment and Advancement of Palestinians). Our students ranged in age from six to twelve. Some had fled the war in Syria in 2016-17. Others are third generation refugees from Palestine, and haven’t been able to return since it became Israel. In classes with Expressive Arts Refuge, the children started to learn the difference between singing with passion and shouting. For longer and longer periods each day, they focused their attention on a director. Their bodies entrained to rhythms they beat out on their bodies. They took turns copying and generating rhythms through clapping, slapping and snapping.. Their repertoire of musical patterns grew. New neural pathways formed. A final concert featured sixty children performing two Arabic songs on violin, guitar, drums, and voice. It was chaotic and hot. Our water bottles vanished and reappeared at the end of the concert. Some of our Syrian boys darted off before we could hug them goodbye and exchange contact information. We regretted the brevity of EAR’s part of the summer music program. An additional week would have resulted in a firmer basis for future musical training; a month could have instilled more familiarity with English and classroom skills. Expressive Arts Refuge partnered with US-based NGO, LEAP. 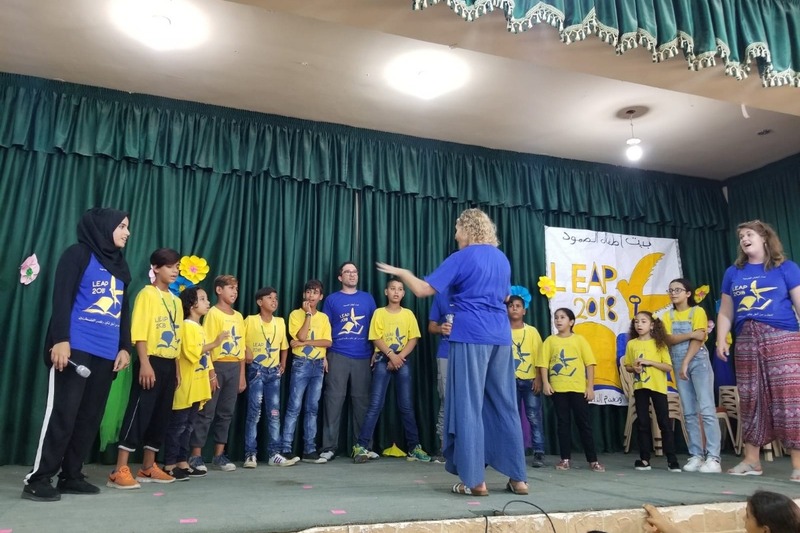 In their ninth year of coordinating volunteer programs in Lebanese refugee camps, LEAP offers substantial summer programs for refugee youth in several Lebanese camps. EAR’s other partner organization, BAS, was founded by and is operated by residents of ten Lebanese camps. BAS (Beit al Assamoud) will offer several ongoing music classes — in oud, guitar, saxophone, and violin. BAS will use the saxophone reeds, and guitar and violin strings that your donations bought. The hand-delivered instruments that EAR brought to Lebanon will remain in the small hands of children who share them. When instruments leave their closet, which is locked, the children handle them with care. Some instruments go home with students who have proven the level of maturity to protect them from whizzing scooters in the alleys, and toddlers in cramped apartments. EAR volunteers stay in touch with our students on facebook. We also remain friends with the youth and adult musicians we met in Calais Jungle in 2016, and Athens in 2017. A lot of love crosses the ocean, encouraging people whose options have narrowed beyond what we westerners can comprehend. A lot of love. Expressive Arts Refuge goes to Lebanon! 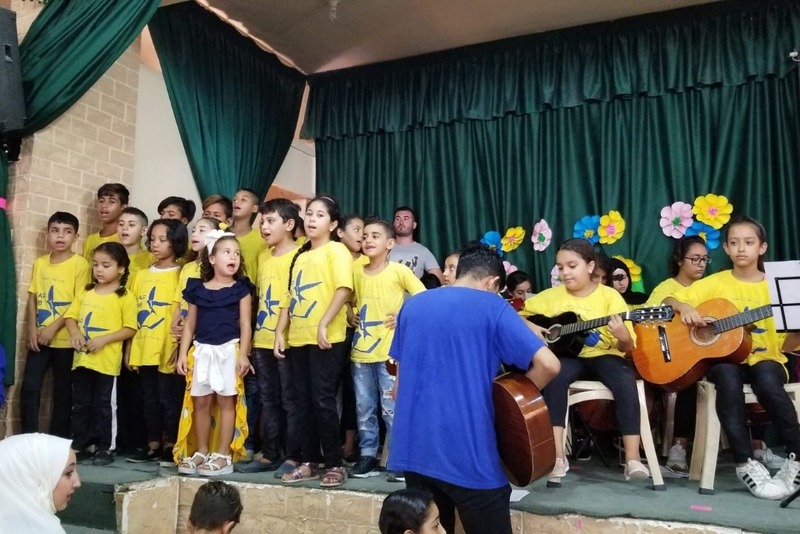 In July-August, 2018, EAR will run its signature music and body music program in Burj el Shamali, a Palestinian refugee camp in southern Lebanon. We’re excited to partner with LEAP (leap-program.org) , a non-profit that has been running educational programs for Palestinian youth in Lebanese camps for seven years. Their partner, BAS, has been facilitating projects in ten out of twelve Palestinian camps in Lebanon for ten years. Together, we’ll teach several daily music classes at Burj el Shamali, produce a final performance in conjunction with other LEAP projects, identify and provide a performance platform for adult refugee musicians. 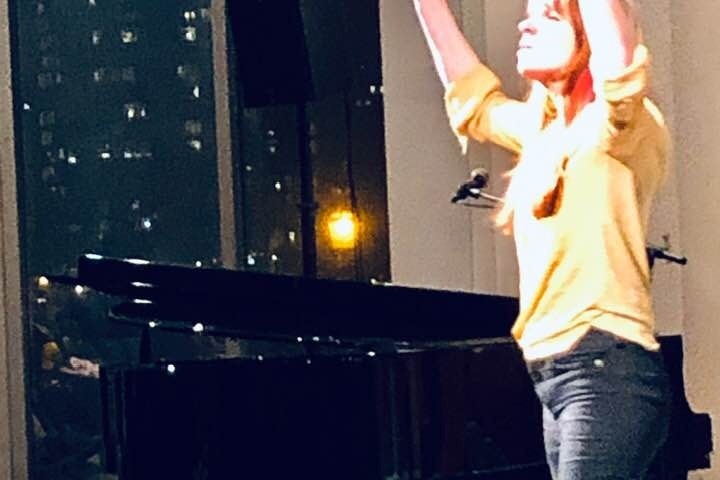 What’s new this year is that EAR director Betsy Blakeslee will train an ongoing music teacher in the subtler aspects of its music and body music program. These include rebalancing the nervous systems of traumatized refugees through structured body music patterns, and stimulating the minds of understimulated refugee youth to enhance learning. Collaborations are always rich. Everyone enhances the skills of one another, and youth benefit not only from the instruction, but from seeing volunteers from several cultures work together. Your donations enhance our music program. They buy musical equipment and musical instruments that stay in the camp after our departure. This year, they will help pay the salary of an ongoing music teacher. EAR volunteers are entirely self-funding. We never spend your dollars on our expenses. If you are in the SF Bay, come to Notes From Home, a benefit concert produced by Aswat Ensemble and World Harmony Chorus. Saturday June 23rd 7:00 – 9:30 pm. Islamic Cultural Center, 1344 Madison, Oakland. EAR director Betsy Blakeslee also directs World Harmony Chorus and will speak briefly; EAR co-director Tawfic Halaby and EAR volunteer Sydney Lea will sing leads. It is with great satisfaction that we share with you how your donations in 2017 were spent. Each summer, all Expressive Arts Refuge volunteers finance their own expenses as they contribute their skills in a European refugee camp. In the camps, EAR partners with organizations to produce music classes, concerts, and musical exchanges with refugee youth and adults. There, we assess firsthand which NGOs offer services that address the needs of refugees not met by overwhelmed EU governments. During the academic year, EAR volunteers work a variety of professions. Several of us perform in World Harmony Chorus at fundraisers. Moira Smiley records and tours. Check out moirasmiley.com. EAR director Betsy Blakeslee researches camps where what we do will have an impact. In 2016, EAR ran its program in Calais Jungle, France. In 2017, Calais and Athens. We are researching exciting options for partnerships in Greece and Armenia for summer, 2018. In EAR’s first two years, we’ve put on four concerts; assisted in the rehearsals and production of an autobiographical play about the refugee journey; and engaged in rich musical exchanges with musicians from Syria, Sudan, Iran, Iraq, and Kurdistan. We’ve developed a form of body music designed to rebalance the traumatized nervous systems of people who have become refugees. We stay in touch on social media with dozens of adults and children whose lives are stalled in camps or other limiting conditions. It is what any of us would want if the situation were thrust on us. A big thank you to everyone who has donated to EAR (Expressive Arts Refuge). The EAR team will spend all funds on crucial items for Calais jungle refugees (under garments, sleeping bags, tents, flashlights). To reduce extra baggage charges, we'll buy things once we arrive in Calais, France. EAR singers -- the Halaby siblings -- will drive from Brussels by way of California and Florida. They'll drive supplies in a rented car that will take the EAR team to and from Calais jungle refugee camp every day. What's also essential is lifting spirits of unaccompanied minors in the camp. We'll get them stomping, singing, and clapping to an exciting repertoire I'm arranging for them. Thanks, Moira Smiley, for her songs in English. Thanks, Raul Cabrera, for his Cuban arrangement of Yemaya. California EAR singers are learning these and Arabic songs to teach them in workshops at the camp. Aug 3rd should be a great concert with Moira, the EAR team, refugee youth and refugee adult musicians! The Palestinian Israeli plight touches my heart. I am pleased to contribute in memory of Ann, a kind woman who touched the heart of everyone she met. Betsy Blakeslee is our choral director. She asked for a donation instead of an end-of-season gift from her choristers.